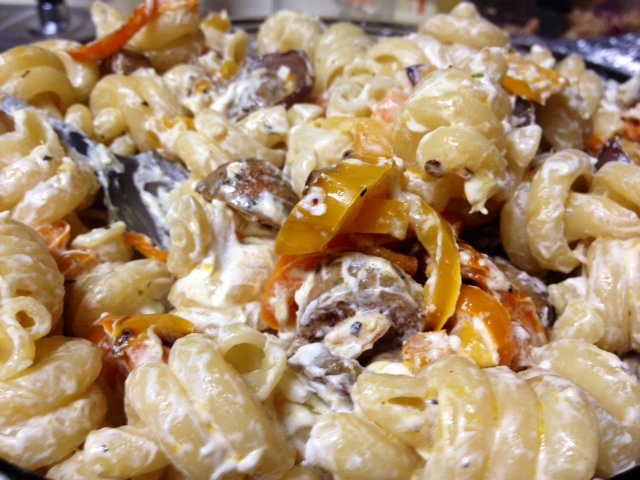 My made-up pasta dishes seem to follow a certain theme—namely, chicken sausage, veggies, and deeeelicious cheese. This is definitely comfortably in that wheelhouse. 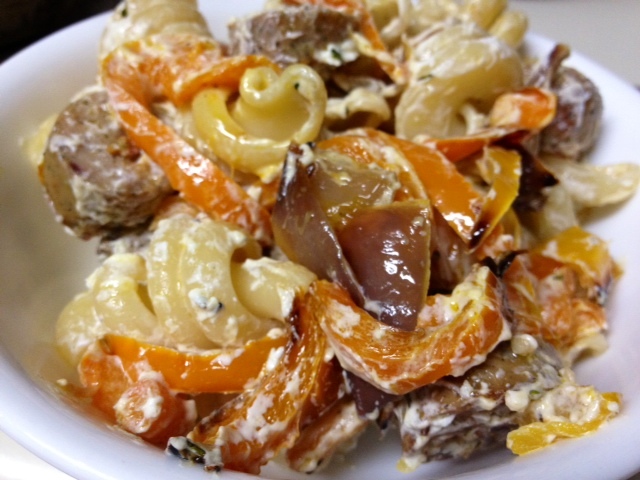 But somehow I like it better than other recipes I’ve made, it had this great mellow flavor. I think the key was forgoing red peppers in favor of their paler yellow and orange siblings, and using red onion instead of white. That, combined with roasting instead of sauteing, took this up a level. 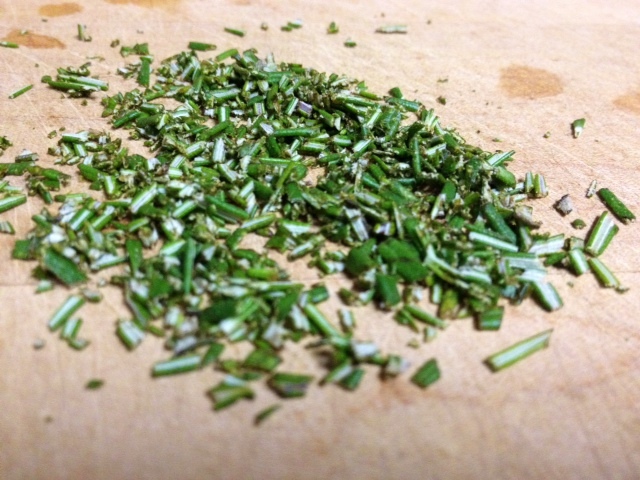 Chop up your veggies into slightly bigger-than-bite-size pieces (they shrink a little as they roast). 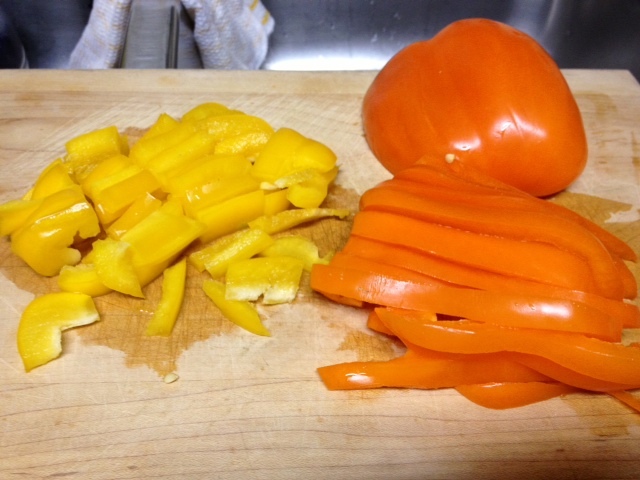 I went with orange and yellow peppers because 1) they were on sale, and 2) they’re more mellow than red pepper, which can be kind of intense. Line a baking sheet with foil (so much less cleaning up! 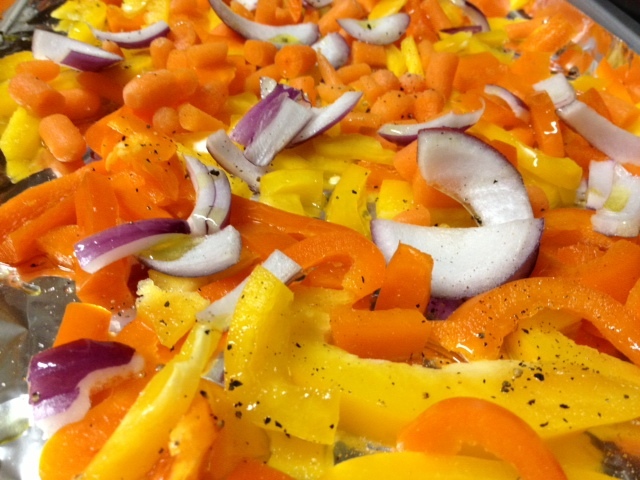 ), toss all the veggies on there, drizzle with olive oil, and sprinkle with fresh-ground salt and pepper. Bake at 425 F for around 20 minutes, until they’re nice and a little shriveled and browned. Boil water for the pasta, then add salt and the pasta. 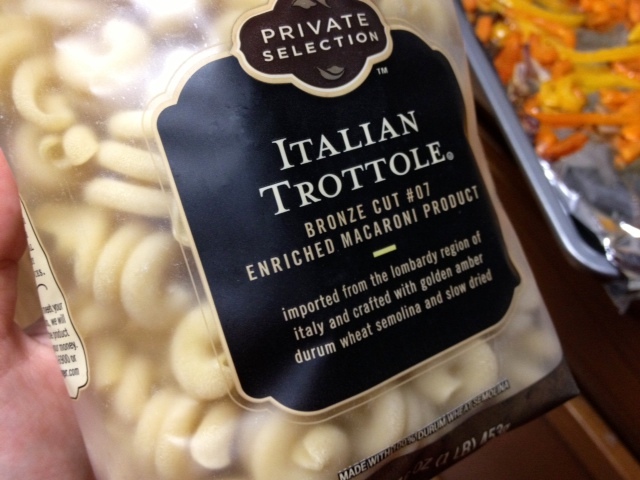 Cook until al dente, likely 8-10 minutes. Save like a half-cup of pasta water to help thin out your sauce and make it stick better. 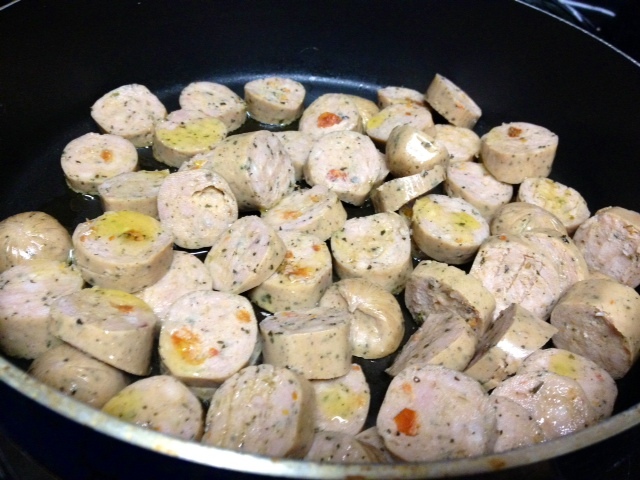 While the veggies are baking and the pasta is boiling, slice up your chicken sausage and saute them in a skillet with a little olive oil, just get them nice and browned. 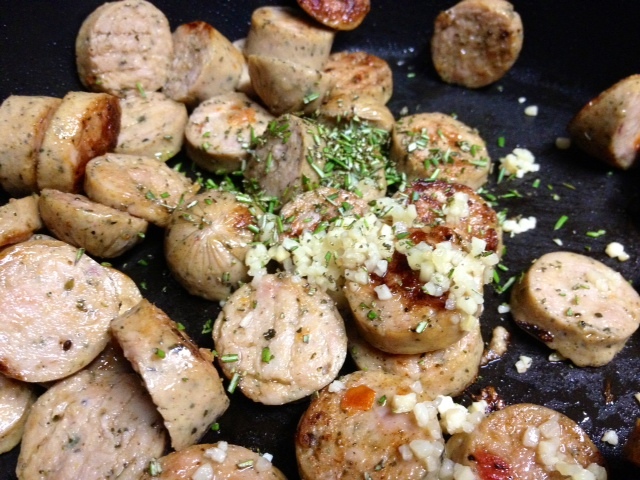 I had some fresh rosemary on hand, so I chopped that up and threw it in with the sausage. Like so. And garlic, there was garlic. 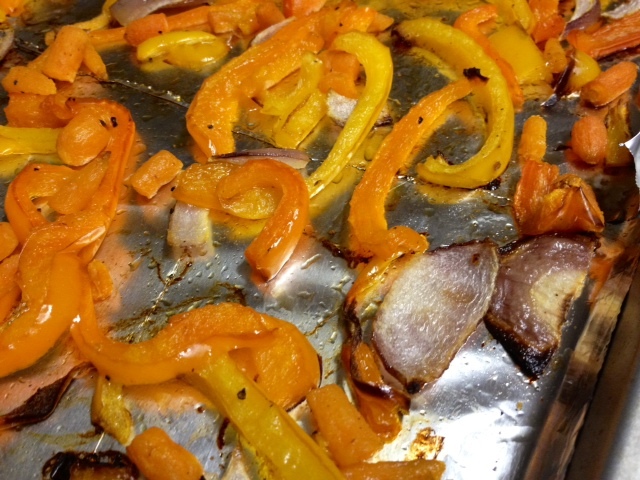 Here are your lovely roasted veggies. And goat cheese, because you can never go wrong with goat cheese and it’s one of the best cheeses at spreading out and creating a sauce. 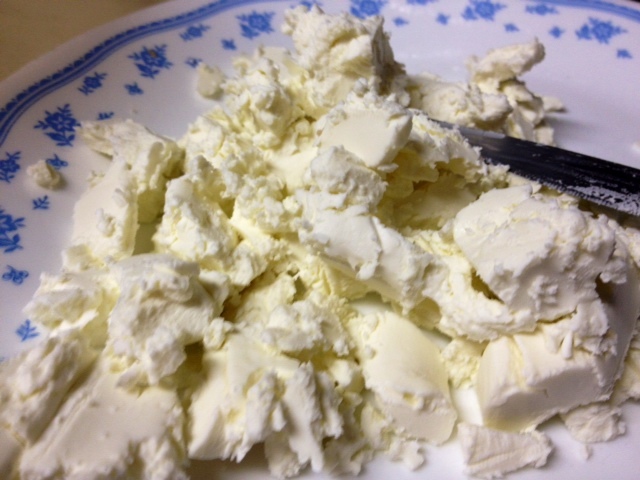 Toss everything together, adding the pasta water to thin out the goat cheese if necessary. One thing I liked about this dish was that it heated up well as leftovers. There was enough sauce on it and the veggies were moist enough that it didn’t become that weird, dry sauceless leftover pasta that you dread re-heating. Chop up your veggies into slightly bigger-than-bite-size pieces (they shrink a little as they roast) and toss on a baking sheet lined with foil, drizzle with olive oil, and sprinkle with fresh-ground salt and pepper. Bake at 425 F for around 20 minutes, until they’re nice and a little shriveled and browned. While the veggies are baking and the pasta is boiling, slice up your chicken sausage and saute them in a skillet with a little olive oil, just get them nice and browned. While it’s cooking, throw in the garlic and rosemary as well. 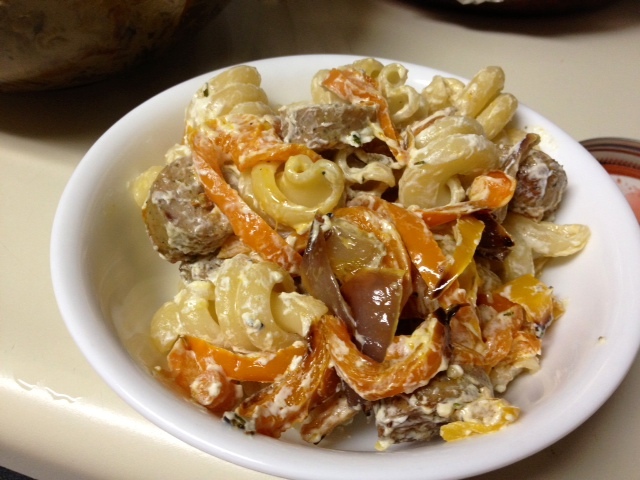 Chop or break up the goat cheese into a bowl and add the roasted veggies, sausage, cooked pasta, and pasta water to the bowl. Toss to coat everything and create a sauce, serve hot.